Let me just start by saying, unabashedly, the Dreamcast is one of my top consoles of all time. So many under appreciated games. Not the least of which were the Capcom fighting games that ran better there than any console before it, giving us a full, arcade quality experience. Not to mention Phantasy Star Online, Jet Grind Radio, the original Soul Calibur etc. Of course, hooking up such an old console to a modern, hi-def LCD is…eye burningly difficult. Its not that the games themselves look bad. They have actually aged well. But, the console came with a composite video cable, only one step above the coaxial connections of the ancient consoles. Luckily, this new tv has a new-fangled VGA input! Unfortunately, Sega stopped supporting the Dreamcast over a decade ago. TO THE INTERWEB! Finding a Dreamcast compatible VGA cable was quite simple. Was only about $15 to boot. Showed up in a few days from Amazon. Plug everything in and, like magic, 480p video output! I must say, even though that is “low-rez”, the graphics still look quite nice. Everything is sharp and colorful if slightly pixely around the edges. HUGE improvement over the composite cable. This is what awesomely weird looks like. Fast forward to day three. 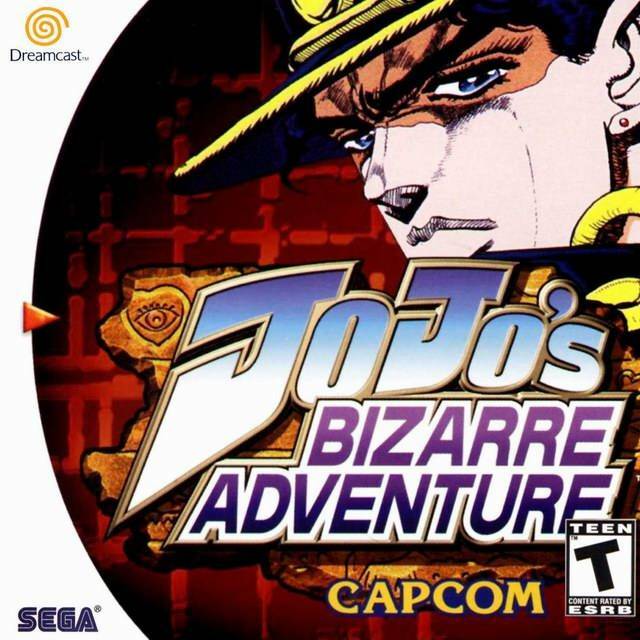 I was having technical issues with a PS2 game on the gen1 PS3 (long story for another article) and decided we would pull out the weirdest fighting game on the Dreamcast: JoJo’s Bizarre Adventure! Still have my original copy from way back when. I mount the disk and power up…why is the load screen yellow? WHY IS THEIR AN ERROR MESSAGE?! 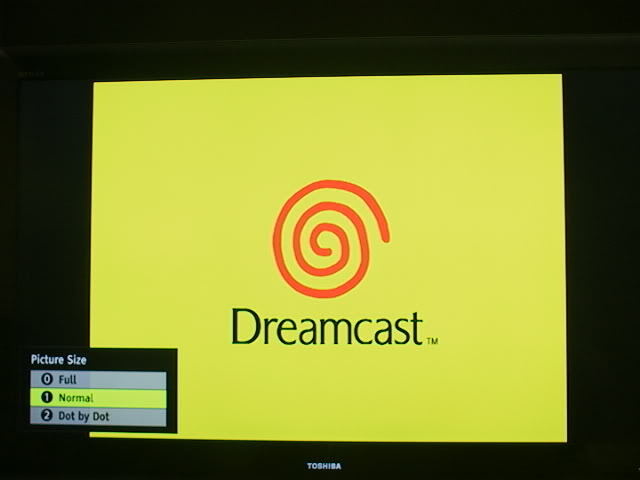 OH GOD WHAT IS WRONG WITH MY DREAMCAST?! Giving in to sleep, I told myself I would solve it the next day. I woke up on Saturday (sleeping in despite my troubles) and decided to try it on my computer monitor. The TV had an HDMI port go bad (which fried the HDMI on the PS3…yet another story for another time) so I figured, maybe, just maybe, it caused an issue with the VGA port as well. Plug into computer monitor and…yellow. WHAT?! OK. Calming myself, I started wiggling the cord. It would turn white, then yellow. Jiggling the cord, it stayed white! OK! Progress. Pulled the cord out EVER so slightly and it continued to stay white with no hint of yellow. Turns out the aftermarket cable had a plug just slightly too long that was causing a bad connection. Problem: SOLVED! Alright back to the TV. White load screen! Error message. WHAT?! Try other games. No error message. Whats going on here? Did an internet search and it turns out some Capcom fighting games only output video at 240 lines of resolution. The VGA cable only does 480. Crap. OK, is their a fix? YES! Using a DC-X (which is primarily for playing imports without modding your system), you can trick the system into outputting a 480 signal. BINGO! Alright. It worked! Sort of! All 240 lines are at the TOP of the screen. See, they were meant to have scan-lines in between each line to make it fill the whole screen. Later Capcom games, it turns out, took this into account and included the option to put the scan-lines back in. JoJo’s, sadly does not. Only way to play is going to be the (shiver) composite cable or get an S-Video cable. On the bright side, all my other Dreamcast games look spectacular. Sorry JoJo.